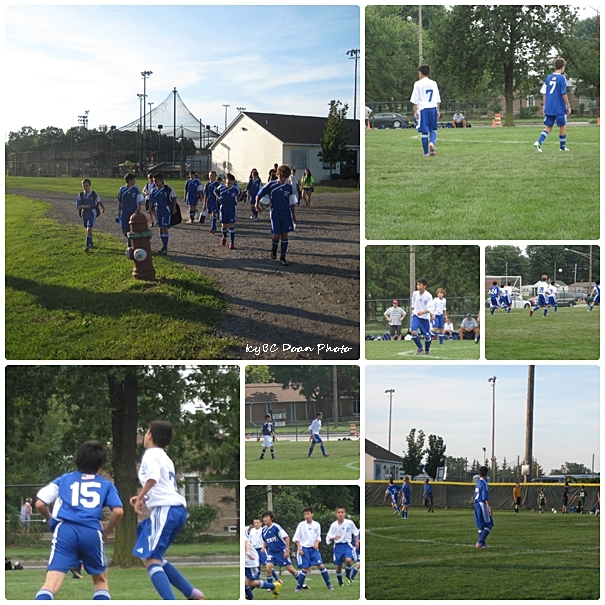 Coming onto the field, JoJo's team looked good and strong but once the game started, the team fell apart. They held back, had no energy, and not given much effort. The line-up then changed resulting in a weak defense and mid-field. 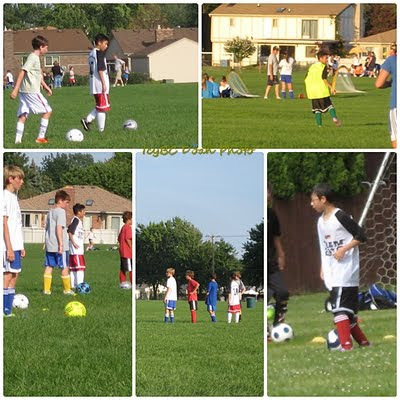 And yes, we had so many practices and scrimmages these last few weeks before the game. This is a wild grass flower called Deptford Pink, or Dianthus Armeria and commonly known as grass pink! It is a tiny little flower that grows among the grass in my backyard. It blooms in July, and only lasts for a few days. The deptford pink usually takes refuge under other plants, and only opens when there is sunlight. You see, I spent quite a lot of time observing this little beauty when my mind is filled with fragment thoughts. This flower might look like the Little Lavender Flower I saw at the cemetery, but it is not! And yes, here is another photo of the tiny little bee again! I'm that odd, but happy with this surprise. Also, I have been told that this is not a bee, but rather a hover fly, by Squirrel Queen, and by a commenter, zBugNerd, who went in great length to explain the differences between the fly and the bee. I really appreciate the information by both! Ok, here comes however, I'm having a hard time preferring to it as a fly, since the body is exactly of a bee! I also see a stinger on its buttock :-). In any case, this little creature is quite fascinating to see. Joining Camera Critters, and Macro Monday ! We were back on the field for the last two practices/scrimmages this week. Our tournament is going to kick off on Friday night, and I would have to be in and out of the house for the entire weekend. Luckily, the tournament is locally so I don't have to travel. I have no idea what these pretty wild white flowers were, but just know that they were delicate looking, and pleasant to discover. Every summer, there are new things to see and learn, even right in my own backyard, and I think this is when we should give credit to the birds and the bees. While admiring the flowers, this little bee landed on another branch right next to it. Lucky me, I got one chance to capture it before it flew away. I love how the colors in the wings shine under the sun light. Happy weekend, everyone! Joining Camera Critters and Macro Monday! Time has elapsed, and it is now five days since I last posted anything on this blog! Reasons for this are numerous, and I couldn't tell which one is more legitimate to use as an excuse. Nah, forget it. 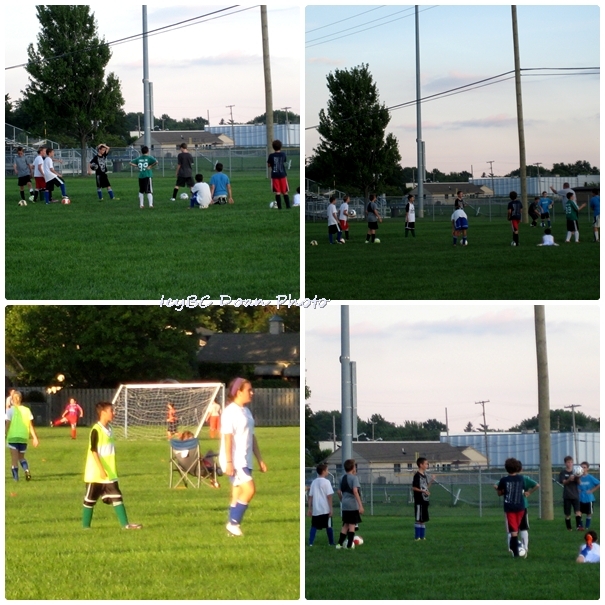 I'm sharing with you a variety of "not-so-good" pictures of JoJo at soccer practices. He is preparing for the Waterfront Soccer Tournament, which coming up on August 19, so we have been out on the field these last three weeks, two to three times a week. These boys are new to each other, and they are Under 13 boys division, but so far they have beaten girls Under 14 and Under 13 during scrimmage. Oh don't laugh, the girls at this stage are twice the sizes of the boys, and they have been with each other for a couple of years already. Nope, this is not an alien bee with four wings, but rather bees doing what nature has intended! Landing in front of my camera, this couple has no care for my present! It was a busy time for these tiny little bees, and they were everywhere in their intimate moment. I'm an intruder, but it was not my intention as I was minding my own business of photographing the yellow mustard flowers. It is the nature of life, and the bees wanted me to know so! They gave me permission and an experience to sharpen my skill of taking the photos.